...makes happy big people! 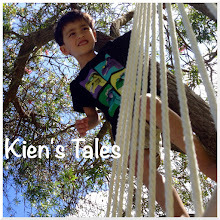 This weekend Kien has somewhat gone back to his old cheerful self with lots of laughter and joviality demonstrated. We are still having some wicked nights i.e. last night where he woke at 1am, 4am and by 5:45am he wasn't going back to sleep for anything. It's been a rough month! His talking and communication skills are coming along quite nicely. He says "naana" for banana, "milk" (as well as signing for it), "more", "yummy", and "chee cha" for either raisin or cracker (and his sign for both of these items are the same - at least he is consistent). He also does the sleep sign and says something that sounds like "sleep time", as well as a whole lot of mimicking the sounds we make and words we say. Over the last few days he has also started signing for water and attempts to say the word. Most of the time though he just points and makes thatnoise - the unmistakable noise anyone who has been around small children (trying to tell an adult what they want) knows the sound of. And when we don't understand, it gets louder. Yesterday we had a visit from Michelle and Thomas. It's lovely to have visitors, especially of the cute variety. I grew up without any cousins at all, let alone cousins my age - so I think it is wonderful Kien and Thomas will grow up playing together (or not) at family gatherings. Jef can tell wonderful stories full of enchantment and adventures with his cousins when they holidayed together. I am envious. Kien, was mostly gentle with Thomas. He is still learning about gentle hands/touch--the word "gentle" gets used a lot around here, and at daycare. Adorable! Thomas and Kien held hands. I'm sure his mother would admit that Thomas has a cute little pout, and he demonstrated this to us a few times. It makes you want to go "awwww" when you see it. But most of the time he was just laid back and content. Last month Kien's daycare had an outing to the Auckland zoo. The day started at 5:45am with Kien screeching and refusing to go back to sleep. Jef needed to get to work early so by 7:00am I was alone in the apartment with a child that points at something but is not satisfied with anything that is offered within the radius to which he is pointing. This guessing game got old pretty quickly so I decided to take him out to preserve my sanity, and ears. We got to the Parnell library on time for Wriggle & Rhyme only to find out it's the school holidays (I'm not that observant of these compulsary interludes) and W&R sessions are suspended. So we went to the next best place - the Winter gardens. I love this place; my friends and I used to wag class in 7th form and go there all the time (and the museum). And of course the ever present box of raisins. He exhibited the same clinging, whining, pointing and general dislike of everything Mummy does disposition post midday (too short) nap. Therefore we got out of the house again. So as a change to our normal rendezvous with the playground down the road I took him Coyle Park instead. I am always so glad that Kien is not phased by other kids pushing him around - he pushes them right back so that he can have a turn! He had a great time banging on the musical keys. Kien and I went to a kid’s dinner last week. It was a lovely Friday afternoon, and we sat in Denise’s garden that was scattered with fun kid's stuff in amongst orange, brown and gold hues to remind us of the changing season. I love the sound of children's laughter floating through the breeze, their happy giggles a reflection of their care free nature. And there is just something magical about seeing children playing together in the background while mothers sip wine and chat contently (albeit briefly). What on earth are those kids up to? The slivers of the suns rays peered through the billowing clouds told us the day was drawing to a close, sooner than we would like, but inevitable none the less. And little William followed us out. We are once again going through another bout of teething - these are his 11th, 12th, 13th and 14th ones...all on the bottom row. Jef thinks he has spotted some more tonight - top incisors *groan*. No wonder my little guy is so unsettled. They are giving him a fair bit of grief despite pain medication and copious amounts of chamomilla. So yesterday was a mixed bag of laughter and tears; when he cries you want to hold him tight and kiss away his tears, and when he laughs it feels like the sun has come out and has dried up all the rain. We had been to Wriggle and Rhyme at the Parnell library in the morning. He was very subdued and did not want to participate, staying on my knees or in my arms the entire session. Even the Hokey Cokey didn't get a laugh out of him. He had an unsettled nap and woke up crying. Through the sobs I asked him if he wanted to eat some raisins and he didn't shake his head (which usually means he doesn't object to what has been offered). He sat on the coffee table and giggled as he pried at the raisins in the box. Some ended up in his mouth (and chewed/swallowed), while others were scattered here-there-and everywhere, and yet he still had a few left over to tip into his Mega-blocks cart. Needless to say if anyone comes to our place you will no doubt step on/sit on or will be handed used and mangy looking raisins by little hands belonging to someone that expects a "ta" and will proudly wait for you to gobble up the goodies he has provided. In the afternoon we went and visited my aunty Le at her house in St Lukes. Kien charged around the place and had a great time being wheeled around on her walker. Both my aunts chanced Kien around with a spoon to try and get him to eat. He teased them with his aloofness...he just loves all the attention of being chased! Every night Kien has a bath before bed. This was him telling me he has had enough. What is it about giant hangers, tarmac, and the smell of jet fuel waffling through the air that makes me feel all giddy and excited? Could it be the giant aircrafts, turbines and engines that lurk around? C'est oui! We had a splendid afternoon hanging out at the airport. They had a stage set up in one of the hangers and had invited a number of "bands" and "acts". A lot of the acts consisted of kids from the Air New Zealand school of rock. The kids performed in bands and played a variety of music - mainly rock 'n roll. It really made me smile watching 10 year old children playing guitar, drums, base and rocking out "best of you" by Foo Fighters. Kien enjoyed the music too. He was bopping his head and bouncing around as he normally does when he hears music. He got hold of the single serve biscuit packet they were giving out at the entrance, and was very determined to rip the covering and get to the contents. No, my sweet boy - it will make you ill and your Epipen is at daycare. There was a charter DC-3 available or a scenic flight around the city. There was also a police helicopter brought in especially for people to climb into and take pictures of. We were such folk. And Kien skipped around the tarmac without a care in the world.